"In this work, the author attempts to review the Facet Theory developed by Louis Guttman and his group. 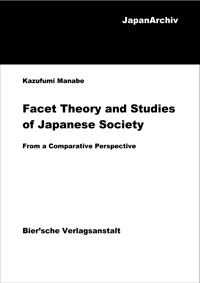 He then organizes the findings of hid empirical research by applying the Facet Theory to various aspects of Japanese society..."
"... His research themes, each representing an actual research topic for social science in its own right, cover a broad range. His impressively penetrating analyses make him one of the most distinguished researchers currently working in Japan. He is an outstanding apprentice and the natural successor to Louis Guttman in Japan. Professor Manabe is one of the few Japanese researchers who has been taught personally by Guttman at the Israel Institute of Applied Social Research (renamed the Guttman Institute of Applied Social Research after his untimely death in 1987), where he studied in 1976-1977 and the summer of 1979. He later developed the methods he acquired there further and made them his own, applying them to the analysis of a wide range of social phenomena. This book is the result of his efforts ..."